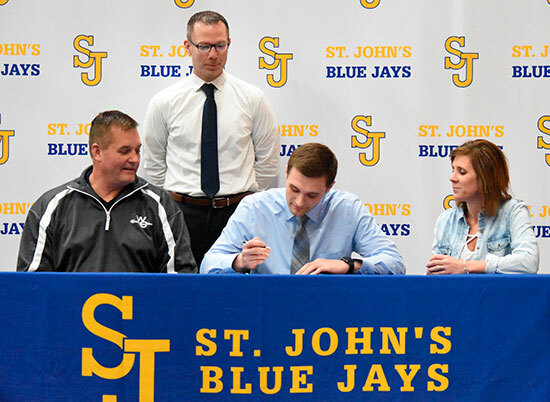 DELPHOS — St. John’s senior Jared Wurst signed his letter to play basketball at Ohio Northern University on Friday alongside his parents Mark and Di Wurst of Delphos and Blue Jay head coach Aaron Elwer. Wurst averaged 17.8 points per game during the 2018-2019 season and is one of only 14 players in St. John’s history to score over 1,000 points. In addition to his outstanding scoring stats, Wurst averaged 7.9 rebounds and played in all 23 games for the Blue Jays last season. Wurst will study civil engineering in the fall and said academics played a big role in his decision making. The 6-foot-4-inch forward was first team All-MAC during the 2018-19 season and garnished District and State honors as well.